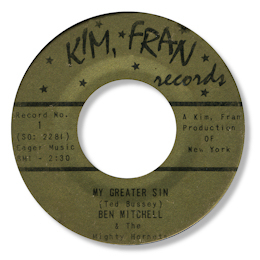 This terminally obscure 45 is the only one by Ben Mitchell that I know – but it is a real killer. Some powerful and desperate vocals here, really commanding and emotionally draining. What could be better? Mitchell is accompanied by a small combo who vamp their way behind him – but really this is all about the voice. Wonderful! Thank to Naoya Yamauchi for the suggestion - and for the date of the 45.